Meet Basra*. 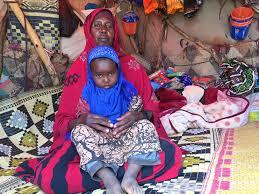 She’s four and lives in an informal camp the heart of Somalia. Basra was forced to flee her home with her mom and siblings when severe drought stuck their region. Unfortunately, they are not alone. Save the Children warns that Somalia is reaching a “tipping point,” and that famine isn’t far off. Back in 2011, famine claimed the lives of 260,000 people in Somalia. Save the Children is taking action now to ensure that history doesn’t repeat itself. While the situation for children and families is devastating, there is hope. Save the Children is providing some of Somalia’s hardest hit areas with needed support, like clean water, food vouchers and cash transfers. They are also providing health and nutrition services for children, like malnutrition screenings, feeding programs and specialized care for malnourishment. This work is instrumental in the relief effort and is helping to stabilize families in the region. Save the Children is calling for action from donors, governments and others to help them continue this important work in Somalia and throughout the horn of Africa. Their work doesn’t end when famine does. By helping children and families in times of crisis, they are building a foundation to help put them on a path to a brighter, more sustainable future. Save the Children gives children in the United States and around the world a healthy start, the opportunity to learn and protection from harm. They invest in childhood — every day, in times of crisis and for our future. Follow Save the Children on Twitter and Facebook and help spread the word.